If you’re looking for a way to remember an auspicious occasion, an Adina watch can be the perfect choice. That’s because an Adina watch is eminently stylish, timeless and made to last. It’s something that can handed down through the generations. What’s more, Adina Watches is an Australian family business which has been crafting their hand built watches in Australia since 1971. Something you might not realise about Adina is that we also work with various community groups and companies to create one of a kind bespoke watches to help celebrate milestone events. These specialty-made watches can serve as the perfect graduation present, a memento for an anniversary or a unique gift for people in the workplace. 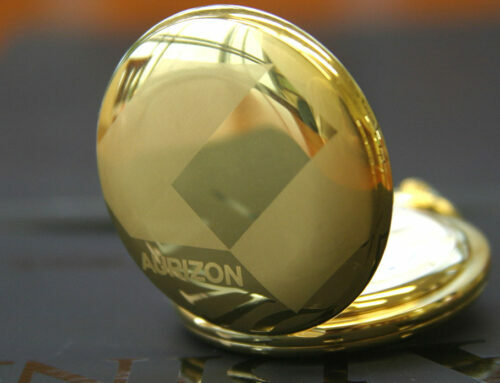 The one-of-a-kind pocket watch that we created for Aurizon, Australia’s largest rail freight company, gifted to employees who’d reached 40 years of service, is just one example of this. Recently, we were nominated for the Educate Plus Excellence Awards for Alumni and Community Relations/Events for our work in creating a bespoke centennial anniversary watch for a Brisbane school community group. In 2017, past students of Brisbane’s Anglican Church Grammar School, known as Churchie, celebrated one hundred years of the Churchie Old Boys’ Association (OBA). 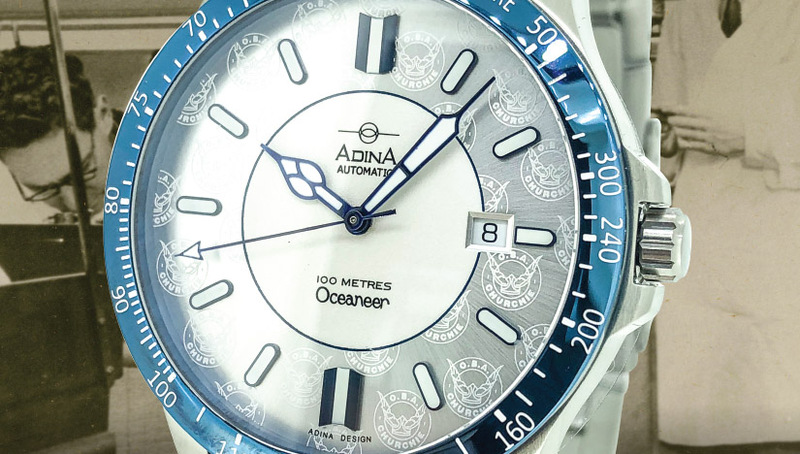 In the lead-up to this event, the OBA commissioned Adina Watches to produce one hundred bespoke, one-of-a-kind watches for Churchie’s Old Boys to signify the one hundred-year celebrations. As Old Boys themselves, Adina Founder Bob Menzies and General Manager Grant Menzies were passionate about enabling the alumni group the chance to commemorate this milestone event with a locally handcrafted, bespoke watch. Whenever a company or organisation commissions Adina for a bespoke item, one of the very first things to happen is that Grant will sit down with the organisation to find out exactly what their vision for their watch is. This is an integral part of the process as it allows all the aspects of the soon-to-be-made watch to be explored. Grant’s inside-out knowledge of the watches in this family-run business means that he can expertly guide an organisation into realising their vision so that the tailor-made watch will be worn and loved for years to come. Different questions are looked at such as who will be wearing the watch? What key lifestyle factors should be taken into consideration? What colours and features will enable the watch to be a unique memento for the occasion at hand? All relevant factors are looked at in order to create the ideal watch. The collaborative process that was carried out between Adina and Churchie’s OBA committee is one such example of this process. Before the making of the watches for the one hundred-year anniversary began, Grant sat down with the OBA to discuss what specific features they most wanted to see in these anniversary watches. Everything from the colours to design to functionality was discussed. First and foremost, they decided that the watch would reflect Churchie’s style in an understated manner. What’s more, the watch was to be both comfortable and stylish, with a timeless design that would suit an Old Boy of any age. The OBA also wanted the watch to have longevity and therefore be something that could be passed down through the generations. A subtle, timeless design that would reflect the understated, well-rounded and refined style favoured by the Churchie community. An inclusion of the OBA’s Viking inspired emblem. A silent nod to Churchie’s colours (with blue and grey being Churchie’s signature colours). A versatile style: a watch that could be worn on any occasion and flatter any attire – from casual to formal. 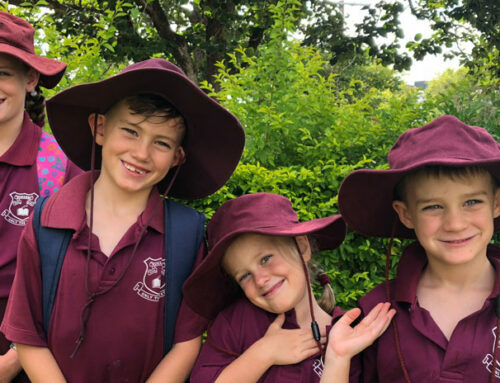 Durable and long lasting: the OBA ideally wanted a watch that could be handed down through generations of Churchie students. A watch that would be flattering to wear for a past Churchie student of any age. In addition to these specifics, it was decided that the Churchie watch would be a mechanical one. Grant says that in order to create a watch that’s truly timeless and be handed down through the generations (as per the OBA’s wishes), a mechanical watch would be the best choice. “By creating a mechanical watch with traditional values using traditional techniques means that this particular watch has the ability to outlast even the newest technology.” General Manager Grant Menzies, Adina Watches. Like all Adina watches, each component of the Churchie watch (seven in total: the case, hand, dials, crown, bracelet, movement, and glass and plating) were made in Australia. Here at Adina, we pride ourselves on connecting with the community at a grassroots level. So even after we delivered the completed specialty Churchie watches to the OBA, the collaboration didn’t end there. In fact, the Adina team was actively involved with the OBA in marketing the Churchie watches. From having an Adina stand with a watchmaker present at the OBA Centenary Gala Ball, to Grant being a keynote speaker at Churchie’s Mothers Lunch, Adina stood alongside the OBA in helping people discover these bespoke and truly unique watches. Every one of the hundred watches were purchased. People who bought the Churchie watch also received the item encased in a luxury timber box, with the added option of having their watches engraved. If you’re involved in a community organisation or company that would benefit from a quality, bespoke-designed watch, Adina can help bring your vision to life! Impeccable in design and made to last, an Adina watch can help create a signature memory for the people in your organisation. To find out more about how we can collaborate with your community organisation or company, get in touch by phone or email. To check out Adina’s range of men’s and women’s watches, click here.